As the industrial revolution boomed and technology grew at rapid rates, human life expectancy increased and we began seeing people live longer lives thanks to medical advances. Mortality rates among the younger population has also decreased throughout the years and diseases that were once death sentences were now treatable. Women who now make up a far greater percentage of the work force are child rearing at much older ages than their ancestors, and it is far more common to have woman need fertility treatments. Technology has allowed us to live far beyond our potential…..or has it cut our potential? Many diseases have not been as prominent as they are today. Cancer is rapid, obesity is an epidemic and diabetes is a common household term. It seems as even with technological advances at our finger tips we are unable to invent away sickness. As our nation is SICK! The question I’ve been struggling with is, are we living longer or are we purely spending more years dying? Personally, I want to spend my years living as vibrant as possible. Many people have sought out the secret to delayed aging; some claim it to be beauty cream, others feel it has been captured in the form of a capsule you take. What if the key to prevent aging lies within our bodies own engineering? What if we possess the key to the fountain of youth and it could be as easy to unlock as putting on our gym shoes and heading out the door? Granted I do not hold a medical degree, however I have had enough education on the physiology of the body and human moment to question modern day medicine. See what I presume the key is, cannot be bottled or sold. It needs to be earned, and worked for. The key to health lies within our bodies’ circulatory system; our bodies own personal transport system. Our cells are dependent upon the circulatory system to provide it with nutrients, water and the oxygen we breathe. We may intake all the proper nutrients but if our body cannot transport it to our cells we our doing our bodies a grave disservice. If you have ever seen the movie Casper the friendly ghost we may remember a scene in the movie were all the ghosts are gorging themselves on donuts and other foods, and everything went right though them and unto the floor. Now this may be an exaggeration, but without our “transport system” at its prime we could be missing out on massive amounts of nutrition. Nutrients that will allow our body to rebuild cells, to regenerate our hair, skin, and nails. Amino acids that codes for our protein. Think about that big kale salad you choked down in a mission to be healthy. Do you really want to have to eat two of them to get the same nutrition out of one kale salad? 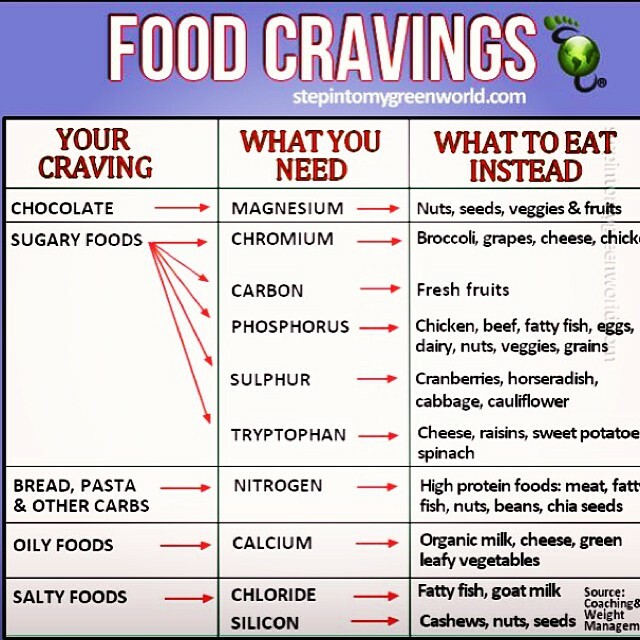 What may be worse than not obtaining the proper amount of nutrients, may actually be what we fail to transport OUT of the body. You see our bodies create toxins, you ingest food, break it down and the byproduct is oxidative toxins. Much like a car gives off exhaust as I uses its fuel, our body has waste breakdown. Vegetables contain antioxidants which helps with the oxidative breakdown in the body, but the constant flow of blood gets those toxins removed. Some toxins will end up begin stored in adipose tissue ie fat cells and as we break down fat for energy our body will dump those toxins into the blood stream. One of the greatest reasons we are seeing greater rates of new diseases, or more commonality of certain diseases is due to the obesity rate we have. Obesity displays two things, greater toxins with in the body. (More fat cells equal greater toxin storage). Decrease of circulation, in most cases. People who fall within the ranges of obesity are typically not getting enough daily activity or accessory exercise. We spend 8 hours a day (if we are lucky) sleeping, 8-9 hours a day sitting at our desks, and an additional 1-3 hours sitting in our cars commuting. When we return home, most Americans flop in front of their television sets and watch on average 1-3 hours of television a night. That is most of our existence in the seated, blood pooling, toxin building position! Our bodies were not designed for immobility, we wouldn’t be bipedal, bone dense, and have the ability to gain muscular strength and endurance. The “cure” or prevention of many human diseases and conditions may lie within our very human make-up. The very human processes we fail to activate on a daily basis. 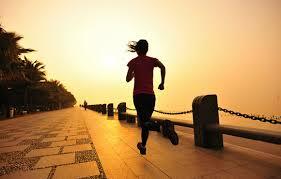 If we are sedentary for 90% of the day, how often does our heart rate increase and our bodies sweat? According to the American Academy of Sports Medicine; “As many as 250,000 deaths per year in the United States are attributable to lack of regular physical activity. “ If physical activity is a key to prevention why aren’t health clubs busting at the seams and our streets filled with runners and cyclists? I remember driving though Madison with a female co-worker a few years back. Madison has always been a hub for physical activity there was never any shortage of joggers or students walking to class. There was a woman jogging down the path dripping sweat. My co-worker turned to me and said “that is so disgusting, why would anyone want to look that bad and have all that sweat come out of them.” I decided against going into the biological processes that go in to sweat and how it’s extremely beneficial for our circulatory system, releases toxins, and makes us healthier; and took it as a lesson in the human condition. People hate discomfort, which is why Curves existed and people will buy a pill that solves their problems before they get off the couch. However, if people saw exercising as changing the dirty oil within their own engines, maybe they would take 20-45 minutes out of their day to reset their bodies into a hemostatic condition. If they knew that their increase in blood pressure would cause blood to flow through their bodies at a greater rate dumping nutrients and taking out toxins at a far greater rate. If they knew that improved circulation within the body has been linked to a slower breakdown and unraveling of their DNA (also known as the aging process). See at the end of the day exercise should not be about punishing our bodies for eating a donut, or trying to fit in our skinny jeans. It should be treated as a daily requirement, in order to live longer, healthier lives. Maybe when we use our bodies as they were designed to, will we spend more of our lives living instead of more years dying. Is your Coffee Habit Destroying your Adrenals? As Americans we will probably never receive notoriety for our patience and relaxed existences. We thrive on Starbucks and Red Bull. You can often hear Americans brag about functioning on only 4-5 hours of sleep each night; when in fact we are actually stressing our bodies to the point of Adrenal fatigue/HPA Axis dysfunction causing memory loss, low concentration, difficulty losing weight, depression, anxiety and extreme levels of exhaustion. Most of us often deal with stressors that are outside of our control; whether it is family, work or another circumstance, and these stressors can have a tremendous effect on our health. Most of us fail to realize that we can help our bodies cope with life stressors through lifestyle changes. Our decisions can help determine how our body is able to respond to those stressors. Although, some decision are harder; such as an unhappy marriage, or leaving a job that treats you poorly. One example, easily changed is the consumption of caffeine. So how exactly does caffeine stress your adrenal glands? Caffeine is a xanthine alkaloid that affects the central nervous system, and acts as a psychoactive stimulant; which increases the rate at which neurons in the brain fire. This, in turn, stimulates both the central and sympathetic nervous systems. This effect can also be described as the “flight or fight response” which is the same adrenaline and cortisol rush you would experience if you were put in a life or death situation. Unfortunately, our bodies cannot rationalize the difference between a mugger and a mug of coffee. Stress on the hypothalamus, pituitary and adrenal glands, are the same regardless of the circumstance. Caffeine feeds the vicious cycle of stress on our adrenals. We lead stressful lives and become sleep deprived, so we start our mornings with a nice cup of coffee that gives us a boost of artificial energy, and increase in cortisol. Later, our bodies start to “crash” so we reach for more caffeine to get us through the day. With the average American consuming an average of 420 mg of caffeine a day, it is not shocking that many struggle with anxiety and compromised adrenal glands. A conscious awareness of ones caffeine intake is important for supporting adrenal health, the ability to deal with stress of life and live healthier. 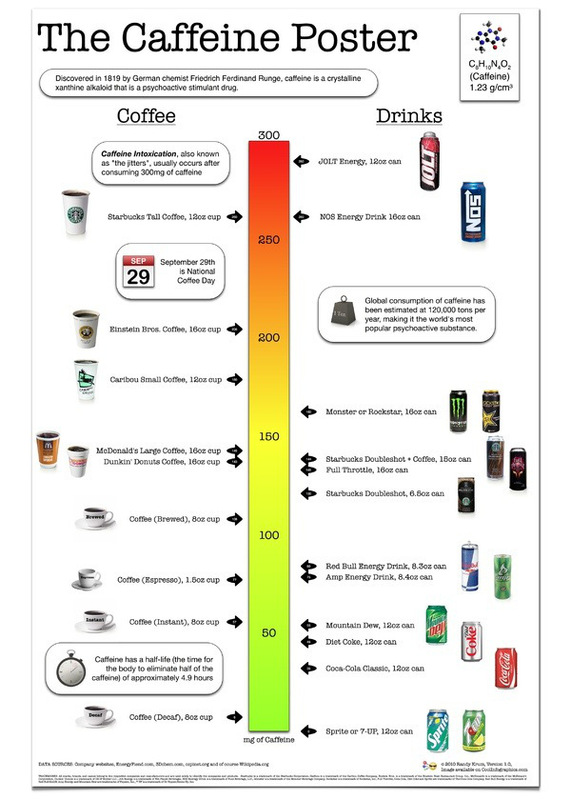 The chart below shows the amount of caffeine (mg) in common beverages. The goal is to stay under 200 mg a day. Your adrenals will thank you and your body will return to homeostasis.